Got this cool fellow in the mail today. I don't know much about it but I just liked the look of him. He's in pretty good condition. Very nice Finno, I don't think I have seen this Super Hikari with the words "Tomy Express" on it, wish I knew more. 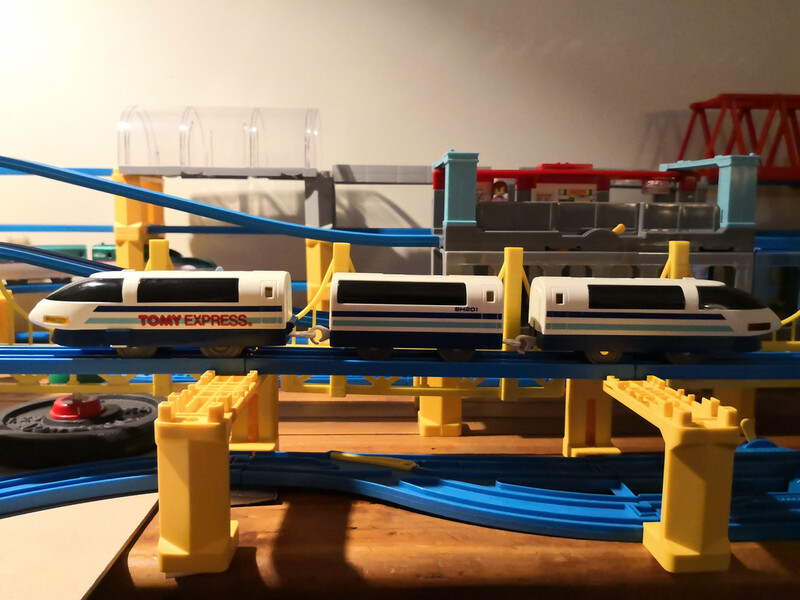 The Plarail/Tomy versions were released between 1990 and 1997 I think. There was also a remote controlled version that I believe Mr Ripley has. The copyright on the bottom says 1988 if that's anything to go by. At least I know it's called Super Hikari now - thanks Super! Well I found this set which has the train but it also doesn't appear to have the words 'Tomy Express' either. Is yours from this set? By the way the other train on this box cover looks awesome too. Wow, I have never seen that set before. What language might that be. Here is my Super Hikari and the Shinkansen 100 Series (I think) is the other train. At first I thought those videos were yours. Did you get yours new in the box? That would be amazing. That Shinkansen 100 is really nice. The Hikari I just got is in very good condition. There were some very minor carpet fibres in the wheels so I know it's been used but when I popped the hood it looked like there had never been a battery in it. It has that same white tape in the battery holder as in the video too. I gave it a run and it goes great on normal and Hi speed. it's pretty much identical except for the Tomy Express stencil. I can't remember if mine was new in box when I got it but at any rate I don't have the box now. I love it as it has that Space Age look.